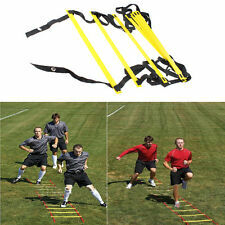 8 Rung Agility Ladder for Soccer Speed Football Fitness Feet Training Carry Bag. 8 rung x Agility Ladder. Total Length: 4M(13FT-8 Rung). Travel & Duffle Gym Bag. A carry bag with string closure for easy transport. 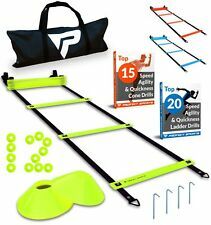 Agility & Speed Workout Ladder Set by F1TNERGY ! ✔ BEST DEAL: F1TNERGY will always take good care of you. Buy and get the Agility Ladder 10 Agility Cones (5 orange 5 Yellow), 4 Strong Pegs, D- Rings attached to the ladder corners and a very cool Nylon Carrying Bag. The ladders rungs can be adjusted to suit various training activities. - Ideal training device to improve foot speed, agility, quickness, stamina, footwork, coordination, acceleration, lateral speed, fitness, strength and more. Speed agility ladder improves acceleration! Speed agility ladder ideal for athletic training, football, soccer, basketball drills, hockey, lacrosse, tennis, badminton. IMPROVE SPEED AND POWER - Ideal for beginners and professional athletes that are looking for improving their speed endurance, balance, agility, jump, acceleration, strength, fitness, conditioning, and reduce the chance of injury with the Yogu Agility Ladder. • Improve foot speed allowing you to accelerate and decelerate faster. Stop struggling with tangled ladders and cracked cones. Your ladder will not need to be straightened or readjusted. When you’re done, simply place the ladder and cones in our carrying bag and zip it up for easy carrying and storage. This training ladder is great for hopping, running or walking drills to increase speed, agility, coordination and sense of balance. Agility ladder can enhance muscle for feet, ankle and ankle joints, keep yourself away from lower extremities injured. 12 Rung Agility Ladder for Soccer Speed Football Fitness Feet Training Carry Bag. 12 rung x Agility Ladder. Total Length: 6M(19FT-12 Rung). TV BRACKET. A carry bag with string closure for easy transport. Adjustable flat plastic rungs for safety. Rungs are 47 cm (16") wide. 15 Foot Length. AGILITY LADDER: Boost your speed and coordination with the 20’ long, 12 rung agility ladder that is designed to increase foot speed, agility, and lateral explosiveness.|WEIGHT SLED: Includes a metal sled that is designed to have weight plates placed on it and can be pushed or pulled.|SPEED HURDLES: The set includes 4 hurdles that are best for teaching proper knee lift, lateral movement mechanics, and developing explosive plyometrics.|FIELD CONES: This equipment kit combo also comes with 6 cones, perfect for marking off locations and boundaries for drills.|AGILITY DISKS: Included are 10 discs making it perfect for setting up drills such as the Mirror Game, Get Up Tag, and Slalom Races. 12 Rung x Agility Ladder. Total Length: 6M(19FT-12 Rung). A carry bag with string closure for easy transport. Improve coordination and speed by practicing foot work. Thick and dense nylon with snap button at the ends for joining. This training ladder is great for hopping, running or walking drills to increase speed, agility, coordination and sense of balance. 1 x 12 Rung Agility Ladder. 2.19FEET long, and 12 high quality flat plastic rungs.Portable device can be carried in your bag and you can use it indoors and outdoors, suitable for all year round. 20 rung x Agility Ladder. Total Length: 10M(32FT-20 Rung). TV BRACKET. A carry bag with string closure for easy transport. Travel & Duffle Gym Bag. Improve coordination and speed by practicing foot work. 13 FEET HEAVY DUTY LADDER: Constructed of 13 feet nylon speed ladder with durable plastic rungs for agility and quickness training. You can piece two ladders together and get a longer agility ladder or simply get the longer version from us. Our Premium Agility Ladder and Field Cones are made with the highest quality and are ready to use right away! Below is what you will get What will our Agility Ladder do for you?. 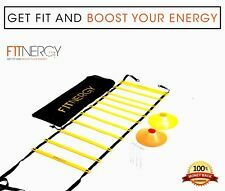 - 19 Foot Long Agility Ladder with 12 Adjustable Rungs. User should use all of these products with care. User should go to Yes4All website to read & follow our safety guideline to avoid any undesired incident. 8 rungs (11 feet), 12 rungs (15 feet), 20 rungs (25 feet). 10 cones - Ladder is 10 feet long. The plastic poles are just extras. Very good condition. Building a solid foundation of athletic abilities and motor skills allows children to develop sport specific skills in a balanced and healthy way. The longer length provides larger space and more intense workout to improve your agility. Constructed of 11 feet nylon speed ladder with durable plastic rungs for agility and quickness training. Agility,Speed12,Rung. Lightweight & Compact. Color:Blue- 8 rung. Trending at $13.01eBay determines this price through a machine learned model of the product's sale prices within the last 90 days. This training ladder is great for hopping, running or walking drills to increase speed, agility, coordination and sense of balance. 1x 12-rung Agility Ladder. Rung Color: Yellow. Rung Size: Approx. Carry bag to keep it organized. 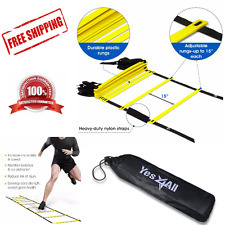 Specifications: Material: PP and Nylon Color: Yellow and Black Length: 13.12FT (4M) Rungs: 8 Rungs Field: training field, gym, training sessions Packing included: 1 x Agility Ladder 1 x Training Bag. SPORTS TRAINING SET: This sports training set includes an Agility Ladder, 5 Yellow Disc Cones, 1 Resistance Parachute, 4 Steel Stakes and a Drawstring Bag. Improve balance, agility, speed, reflexes, and explosiveness with this sports training set. This sports training set includes an Agility Ladder, 6 Yellow Disc Cones, 1 Resistance Parachute, 4 Steel Stakes and a Drawstring Bag all at a value price. Improve balance, agility, speed, reflexes, and explosiveness with this sports training set. You're buying what you see. Great shape. Product: Agile training circle. Training Circle 1. The shape of the hexagon can be freely combined to create your own training style. It features high quality PP material with long service life. Material: PP. 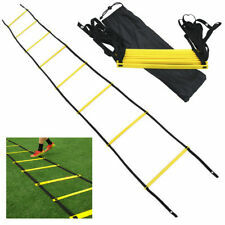 This Speed and Agility Training Quad Ladder by Uber Soccer has a center base with four separate 15 foot long ladders extending out from each side. The Speed and Agility Training Quad Ladder is a training tool for speed, agility, endurance and team sports training. Adjustable flat plastic rungs for safety, 8 rung heavy duty design that last for years. This training ladder is great for hopping, running or walking drills to increase speed, agility, coordination and sense of balance. Nike Speed Ladder - Ladder consists of durable rungs that help make up agility and speed training courses for athletes of all skill levels. Made with durable, shatterproof rungs and plastic inserts in webbing to keep rungs evenly spaced during drills. (2 in 1 Kit) - Speed and Agility Hurdles Agility Speed Ladder Carrying Bag. Condition is New. Ladder has 12 rungs and is 20 ft long. Awesome for any drills. Shipped with USPS Parcel Select Ground. AGILITY LADDER DESIGNED TO LAST FOR YEARS - 12 heavy duty plastic rungs - 19 ft (6mt) - capable of supporting long training sessions. MAXIMIZES YOUR EFFORTS AND IMPROVE YOUR AGILITY, CONCENTRATION AND ENERGY. Train elite with this portable ladder. Sharpen your focus, concentration, and form for quicker, light-footed movement. Train with more focus and concentration, and take your physical and mental skills to the next level with this tool designed to boost your power, endurance, and athleticism. Item is new and still sealed..